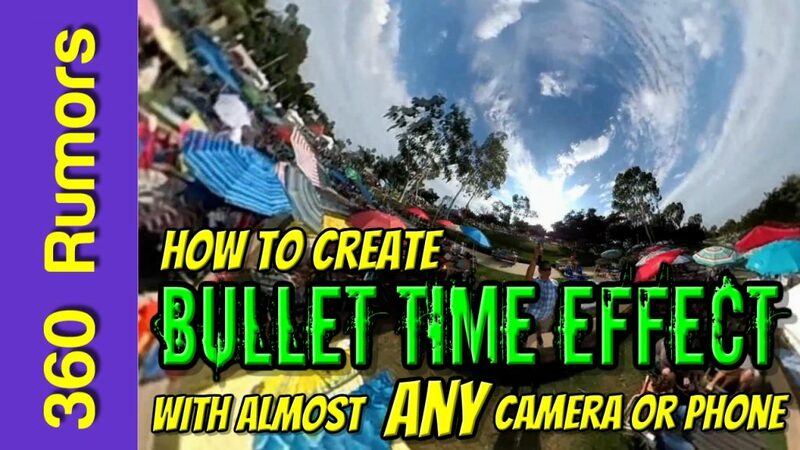 Here’s a tutorial for making a bullet time effect video using almost any camera or even a smartphone, with or without stabilization, 360 or not 360! The bullet time effect first astounded audiences in the Matrix. Later, Swiss freeskier Nicolas Vuignier created a similar effect using an iPhone attached by a string to a winged stabilizer, shooting at a high frame rate. The effect became popular again because of Insta360’s ad campaign for the Insta360 ONE, which can shoot at a high frame rate and has built-in image stabilization so that you can swing it around with a string, without a stabilizer. The ONE even includes a string for this effect. 1. Here’s the swivel adapter I used. Gearbest used to have it as well, but it’s out of stock and according to my GB rep, they have no plans to restock it. 2. This monopod is similar to the one I used for my smartphone and GoPro Hero5. The long one I used is the Kodak PIXPRO monopod. 4. Camera: The difference betweeen a 360 camera and a regular camera or smartphone is that the latter provide a fixed perpsective whereas a 360 camera can provide several points of view. And it’s ok if your camera doesn’t have a high frame rate — you can spin it more slowly. 1. 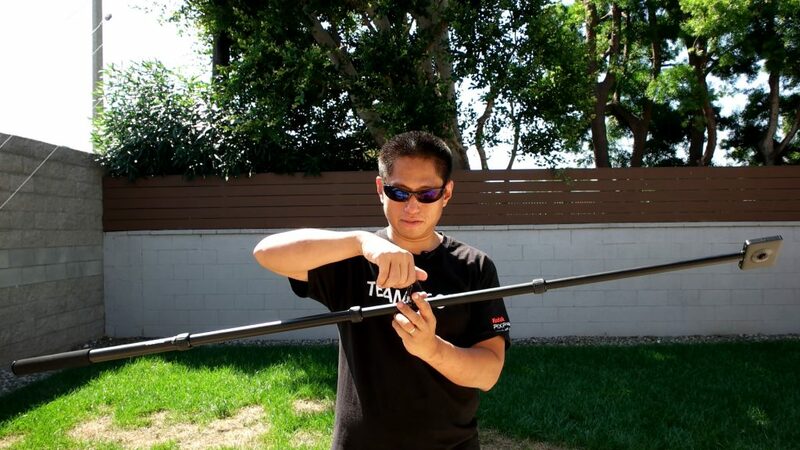 Attach the camera or smartphone to the monopod or selfie stick. It is best to position the camera so that the monopod or selfie stick is not in the camera’s view. For a smartphone or action camera, you can use the live preview screen to angle the camera until the monpod is just outside of the frame. For most 360 cameras, the camera should be in-line with the selfie stick or monopod. For the Kodak Orbit360, which has asymmetrical lenses, use the live preview on the phone app to find the angle where the monopod appears invisible. 2. Attach the swivel mount to the monopod or selfie stick. 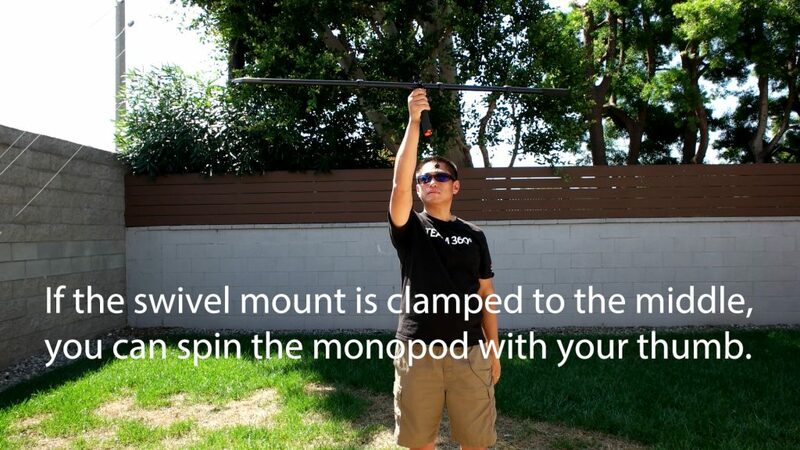 If the monopod is long, consider attaching the swivel mount to the center of gravity (balance point). For shorter monopods or selfie sticks, attach the swivel mount to the handle of the selfie stick. 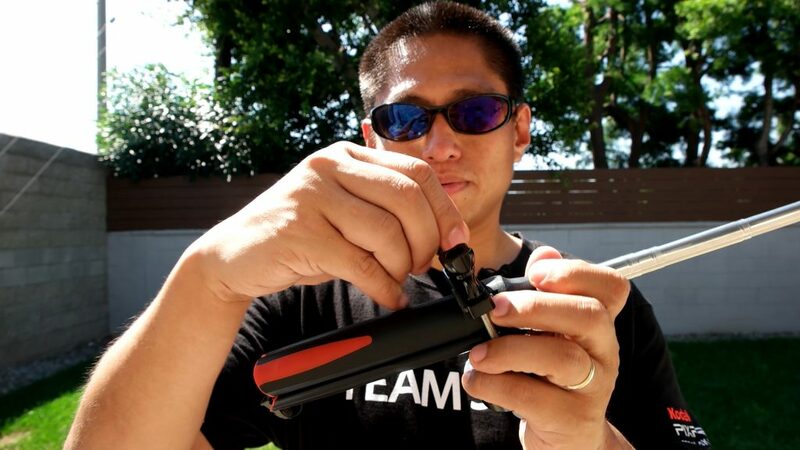 For longer monopods, attach the swivel mount to the center of gravity / balance point. This will make it easier to spin! 3. Attach the swivel mount to a handle with GoPro style mount. Caution: Please check your surroundings. You wouldn’t want to hurt anyone, nor would you want your camera to hit the wall or some precious artifact! Before recording, switch to a high frame rate mode if available. 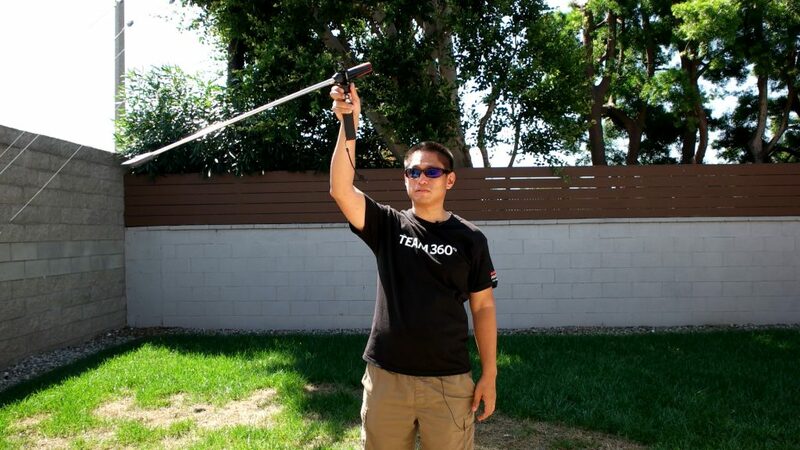 Begin recording and spin the monopod / selfie stick. If you are shooting for slow motion, then as a reminder, the video will be much longer when played back at normal speed, so you don’t need to record such a long video. If your camera doesn’t have a high frame rate mode, then spin it slowly. Unlike the string or centriphone method, you don’t have to spin it fast to keep the camera aloft. If you are using a stabilized 360 camera such as the Xiaomi Mi Sphere, you won’t actually need the stabilization for this kind of video, because the camera will be more or less level. so you should disable the stabilization option if possible. For a smartphone, action camera, or 360 camera used in non-360 mode, use almost any video editor with slow motion capability. You can play back the video at 30fps, 24fps, or even 18fps. If the editor provides a frame blending or similar option, you can probably get better results by using it. For a 360 video, you will likely need to level the horizon first. To do so, I use Adobe Premiere Pro’s VR Projection . Here is a tutorial. After the horizon is leveled, you may need to move yourself to the middle of the video. You can use the Offset effect to do that. Finally, I would apply the slow motion effect. If you shot a 360 video, an optional step is to convert the 360 video into a tiny planet or ‘overcapture’ style video. To do that, I use Insta360 Studio, a free app from Insta360.com. Insta360 Studio allows you to make multiple transformations of a 360 video using keyframing and export the video as full HD 1920 x 1080. To get a crash course in using Insta360 Studio, jump to 04:18 of the video. That’s all there is to it! What do you think of this technique? Is it something you’d like to try? Let me know in the comments! Hello friend! Please do! And let me know how you like it! But I hope this fad passes quickly. Just like the 360 plotagraph stuff from a few weeks ago. Interesting in the hands of a skilled videographer, but a crutch for most everyone else. Camera manufacturers are going to love it as inexperienced users crash their cameras and need to buy new ones. Lol thanks Bill. Well we’ll just have to see if this fad has legs. The Insta360 ONE is about to ship, and when it comes, it will be interesting to see how many people use the feature. Hi Ed. You can use any video editor with a slow motion function, including some free ones such as Windows Movie editor. How to add a 360 photo to a Facebook comment – two easy ways to do it!